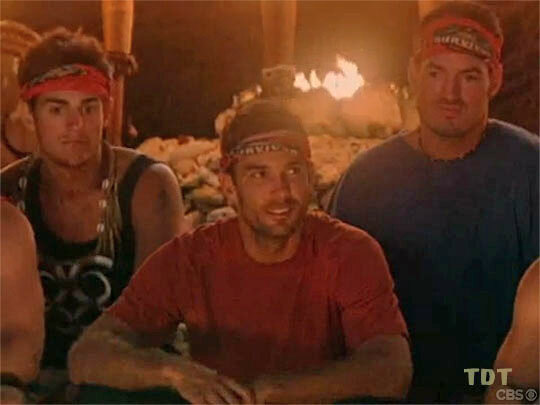 Survivor: Vanuatu (2004) - 14th place, 5th out. 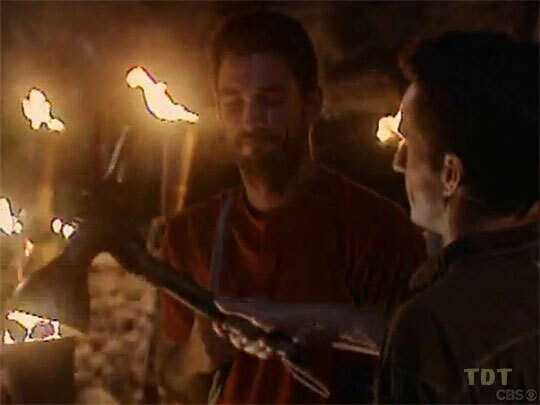 Voted out in Episode 4, "Now That's A Reward!" (Day 10). Vanuatu Ep. 1 RC/IC: "Fire Starter" - Performs well himself, but thanks to Chris's allergy to balance beams, Lopevi loses. Vanuatu Ep. 2 RC: "By the Numbers" - The only Lopevi to get across; Lopevi loses again. Vanuatu Ep. 2 IC: "Four on the Floor" - Blindfolded, collects pieces, and finally, Lopevi wins! Vanuatu Ep. 3 RC: "Great Escape Run" - Helps pass people through the final gate; Lopevi wins reward. Vanuatu Ep. 4 RC: "Remembrance" - Lopevi loses. Vanuatu Ep. 4 IC: "Tribal Tiles" - Lopevi loses again. Vanuatu Ep. 3 IC: "Great Escape Run" - Not among the challenge leaders, does not win (bottom 5/8). Vanuatu, Ep. 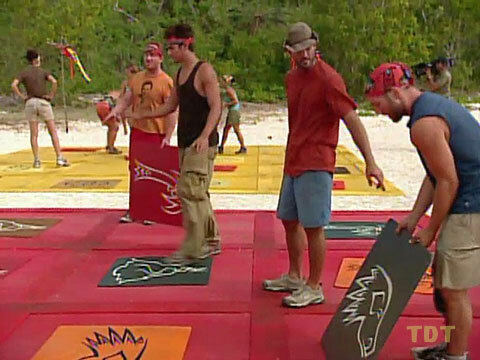 4: Six votes, from Chris, Chad, Sarge, Rory, Bubba, and John K. (voted out, 6-1). Yes, Jeff. This tribe has been playing an individual game since Hour 1. Rene Syler at CBS's The Early Show (10/7/04): "Bon Voyage, Brady!" Cynthia Wang at People.com (10/8/04): "Brady Finta"
"Brady Finta was born in San Diego. At the time, his father was in Vietnam on one of his two tours as a fighter pilot in the US Navy. With his father being in the US Navy, they relocated many times, including Camarillo, California; Virginia Beach, Virginia; Pax River, Maryland; San Diego, California; Fairfax, Virginia; Charleston, South Carolina; and Memphis, Tennessee. Finta attended 10 schools before high school and finished at James Island High School in Chas, South Carolina. He then attended the University of South Carolina, where he received a degree in Political Science and played on the rugby team. After spending the summer after graduation in Norway (his father was stationed there), Finta went to the Marine Corps Officer Candidate School as a result of having gone through college on a Marine ROTC scholarship. He became a second lieutenant, trained as an infantry officer for a year and was then assigned his first platoon in Hawaii. After three years (with one year of it deployed to Japan), he was transferred to Camp Pendleton, California. Approximately two years later, he resigned his commission and joined the FBI in 1998. After graduating the FBI Academy, he was posted to the Los Angeles Division (Orange County) and assigned to the Asian Organized Crime section, where he has been ever since. Soon after completing his agent probation, he tried out and was selected to be a member of the FBI Los Angeles SWAT Team. He will soon be working counter terrorism. Finta's mother is currently pursuing a master's degree in theology at a Jesuit University in Ohio. His father retired from the Navy and lives and works in Spokane, Washington. His older brother, Jim, is a helicopter pilot for the Coast Guard in Seattle, Washington. His older sister, Lori, is a film editor in Memphis, Tennessee. His younger sister, Gina, is a dance instructor in Baton Rouge, Louisiana. He also has a half sister, Katya. In addition, has eight nieces and nephews. Finta's hobbies include surfing, home improvement and traveling. He has traveled the US and abroad, having served in Okinawa, Japan, among other places. He describes himself as enthusiastic, athletic and motivated. He enjoys playing rugby and watching football. His hero is a 20-year-old lance corporal who returned from Iraq missing an eye. To Finta, that kind of courage and self-sacrifice defines heroes. Finta currently lives in Huntington Beach, California, with his fiancée, Broni. His birth date is December 17, 1970."